Check out this adorable dog and his playful pal, the kitten. Ticks are parasites that can be deadly to our pets, other animals and to humans. Although ticks are commonly thought of as insects, they are actually blood-sucking arachnids like scorpions, spiders and mites. Ticks can be present anywhere-from deep woods, urban parks to our own backyards. Adult ticks attach themselves to the tips of grass blades and vegetation and transfer themselves onto passing animals or humans. Ticks are not very mobile – they rely on passing animals to both feed on and for transportation. With their hairy coats, closeness to the ground, playfulness and love of exploration dogs are the perfect host for ticks. The tick will attach itself to a warm, moist and dark place on the body then insert a probe into the skin and begin sucking blood. Dogs are apparently 50 to 100 times more likely than humans to come into contact with disease-carrying ticks. As a result, each year thousands of dogs contract Lyme disease, anaplasmosis and other vector-borne diseases. Signs of Lyme disease in dogs are difficult to detect, and warning signs may not appear until several months after infection. Signs may come and go and can mimic other conditions. Cases vary from mild to severe. In severe cases of Lyme disease, kidney failure can occur and the result, fatal. You need to check your pet for ticks. It is easier to feel for ticks than to look for them. Mostly, the ticks are found around the head, neck, chest, front legs and especially behind the ears, with many exceptions. At first glance, a tick may look like a small grey dot on your dog’s skin but eventually the tick will grow in size and appear wart-like. In tick prone areas, it is essential that you do a daily search for ticks. You need to check from nose to tail to check for ticks. Ticks attach themselves by embedding their claw-like mouth parts into a victim’s skin and feeding on its blood. If this check is done routinely, you can then eliminate tick paralysis because the tick usually has to be on the animal’s body for more than two days to cause paralysis. Remove a tick as soon as you discover it. Use fine pointed tweezers and grasp the tick as close to the skin as possible (making sure to grasp the tick where the mouth parts are embedded into the skin). Gently pull the tick straight out with steady pressure. If you have difficulty, seek veterinary help. Do not try to kill the tick by dabbing it with methylated spirits or other chemicals. This will cause the tick to inject more toxins. If the tick is accidentally pulled apart and the head stays in the skin, there is a risk of being infected with other microscopic organisms. This kind of infection has nothing to do with Lyme disease, but can still be dangerous and unpleasant and its worth taking your dog to the vet for assistance. If you have a dog with a long coat, a comb is a great way to find ticks. You need to comb your dog from the top of the head and go through their fur, running the comb backwards, against the grain of the fur, followed with your hands. Feel for any bumps and if you feel one, stop and have a good look. You need to pay particular attention to armpits, behind the ears, and in the ears. To create a home environment that is free of ticks, as a precaution, you should regularly mow your grass in the backyard and keep mulch and leaf litter away from the main entrance to your house. Trim shrubs, overhanging paths and play areas. This not only protects your pets from ticks but also protects you from them also. Luckily for dog owners, a wide array of pest control products for pets are available from your pet store or vet. These include foggers, sprays, dips, powders, dusts, collars, oral liquids and tablets, and even a liquid one-spot topical treatment. Your vet can advise on an effective tick control programme for your dog. I found this information on a free dog resource site – they are happy it is shared. Boredom can cause huge problems in terms of your dog’s behavior – digging, barking, you name it! Boredom and variety are always inter-connected when it comes to dogs misbehaving. Yes. This is true. Many a times, boredom can be managed with a variety of materials that will distract the animals to a greater extent. Hence, the dog may not do the abnormal or unwanted activity arising out of the boredom experienced by it. Boredom experienced dogs may have different types of behavioral patterns. For example, some dogs will bark continuously and some may be engaged in constant digging activities. There are many ways to get your dog out of these boredom activities. Dog toys are a must. A buster cube with multiple treats may be placed in the dog’s shelter and the animal soon understands how to roll the buster cube to get the treats it prefers. A Buster Cube is an ingenious toy used for simulating and activating your dog during play and feed time. Instead of placing the food monotonously in one place, change the place of feeding suddenly. Such actions will be helpful in removing boredom-like activity in your dog. Activities pertaining to boredom need to be redefined well by the dog owners. This will help them to a greater extent to drive away the unwanted behavior patterns in their pet dogs. For example, some dogs may often have destructive biting characteristics and will be seen biting chairs, material, mats, and everything that can see. After ruling out the teething problem if it is a puppy, provide it with some large sized balls, mineral mixture based bone materials, etc. Such variety of materials help to reduce the boredom related activities. When you take your dog for a walk, say a word every time he/she urinates. Consistently use this word every time this happens. Your dog is intelligent and will eventually understand the meaning of this word. We use the word “pee”. Now, before we go to bed we take Lucy into the yard, say the word “pee”and she goes and does her business and we have no accidents throughout the night. It’s been a great easy tip for us so I hope it is useful for you also. Dog Supplies – What Do You Need To Start With? through their day and week, so does a dog. stock the proper dog supplies to make it a happy relationship. experience, and avoid hurting his neck. Leash - Taking your dog for a walk means you need a leash. brushes and combs to be able to keep their long hair manageable. You also need to look for shampoos that are safe for your dog. the soap or shampoo you chose. skin, which could require surgery to fix. 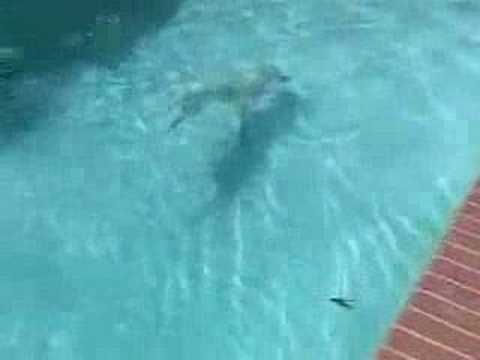 In today’s funny dog video we see a gorgeous dog fetching something from the bottom of the pool! Unbelievable – and hope it was just a one off! Maybe it’s a water baby? Is that really a cat? 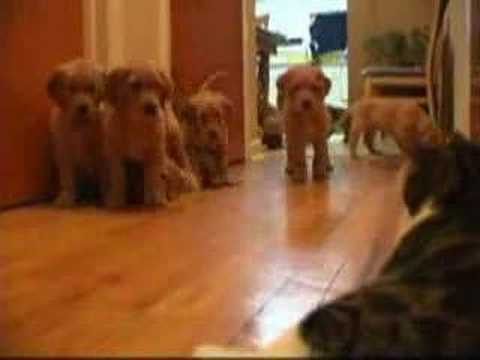 In today’s funny dog video we see a pack of pups approaching .. what is it – a cat? They move a little closer each time to the enemy..
Today’s funny dog video is in Japanese – regardless of where we are in the world, funny dogs are all the same. See for yourself..